AFRICANGLOBE – Western countries that imposed illegal economic sanctions on Zimbabwe, are threatened by China’s growing business ties with Zimbabwe and other African countries and are making spirited efforts to scuttle the Asian country’s deals through a media onslaught, Chinese Ambassador to Zimbabwe, Mr Lin Lin has said. Responding to questions while delivering a public lecture at Midlands State University last Friday, Ambassador Lin said Western countries were feeling the heat of China’s mutually beneficial relationship with Zimbabwe and other African countries and were working tirelessly to disrupt his country’s efforts to revive African economies. “There are some sectors of the Western media that are trying to tarnish China’s image by claiming that we want to siphon resources from Zimbabwe and Africa at large. They are the former colonial masters of Africa and they want to break the fabric between China and Africa. “They have imposed sanctions on Zimbabwe and the country has suffered a lot, particularly the economic sector,” he said. The West’s illegal sanctions regime is estimated to have cost Zimbabwe over $42 billion in revenue since 2000 in addition to shrinking the economy by a factor of over 40 percent. Ambassador Lin said China was not there to siphon resources from Zimbabwe, but wanted to partner the country to ensure it revives its economy that was bludgeoned by the illegal sanctions regime for over a decade. The paper’s online version had a picture of President Mugabe inspecting a guard of honour mounted by the Chinese Army during a state visit. The Telegraph of the UK also weighed in with an article “China is trying to colonise Africa,” with the paper expressing concern why the Asian country was moving to cut mega deals with African countries. Forbes Magazine of the United States of America also had an article “China Understands What The West Doesn’t: Africa Is Our Next Superpower,” and expressed displeasure over the way the USA was losing grip in Africa to China. Such claims, Ambassador Lin said, were being propagated by Western countries threatened by the win-win deals China was sealing with most African countries. 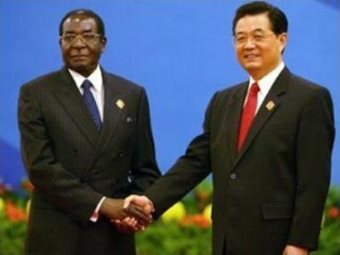 “China and Zimbabwe are partners. China is not in Zimbabwe to siphon its mineral resources but we are partners in many aspects. We do not only partner Zimbabwe in the mining sector, but we have supported the country’s agriculture. We are very supportive of the country’s objective to avert hunger and ensure food security at household level. We are also partnering Zimbabwe in developing the country’s infrastructure. “Zimbabwe has many natural resources which it must properly utilise to rebuild its economy. We have partnered with 17 countries in Africa,” he said. According to Zim Asset, the country’s economic blueprint, infrastructure development mainly in the power and transport sectors has been identified as a key economic enablers, while food security and nutrition would ensure a healthy nation. Ambassador Lin said China has remained committed to assisting Zimbabwe in reviving its economy which was derailed by the illegal sanctions imposed by western countries. He said China would give as much support as it could to ensure Zimbabwe extricated itself from the economic challenges. Ambassador Lin said Zimbabwe had benefited more from the two countries’ cordial relations. He said the bilateral trade between the two countries had yielded about $ 1.1 billion worth of deals. “We invested more than $602 million in Zimbabwe last year which is China’s biggest investment in Africa. “As of last year, China exported goods worth $440 million to this country while Zimbabwe sold us goods worth $688 million of which over $400 million was from tobacco exports. China is there to help Zimbabwe achieve economic recovery,” he said. Ambassador Lin said China had recommitted itself to helping Zimbabwe revive its economy during President Mugabe’s recent visit to the Asian country where he inked mega deals that have immense potential of reviving the economy. “We have been partners with Zimbabwe dating back to the time of the liberation struggle. We continue to support Zimbabwe,” he said.